"A favorite in our house, made entirely from unprocessed products. You'll love the clean taste and won't feel guilty about seconds! For the best flavor, use more authentic curry powders like garam masala, or even curry paste from Thai specialty shops." Place a steamer insert into a saucepan and fill with water to just below the bottom of the steamer. Bring water to a boil. Add broccoli and green beans, cover, and steam until tender, 2 to 6 minutes. Place broccoli and green beans in a 9x13-inch baking dish. 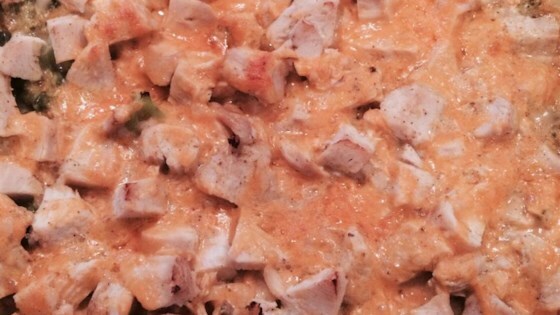 Cover with chicken and 1 1/2 cups Cheddar cheese. Heat chicken broth in a saucepan over medium heat until almost boiling. Mix a small amount of broth with flour in a bowl to create a paste; whisk paste into remaining chicken broth until thickened. Stir in yogurt, fish sauce, lime juice, and curry powder. Season with salt and pepper. Pour curry mixture over chicken. Sprinkle with remaining 1/2 cup Cheddar cheese. Bake in preheated oven until bubbly, 30 to 45 minutes. Learn how to make this fragrant, delicious, Indian-inspired chicken dish.